Happy Saturday! I hope your weekend is off to a great start. It's a cold and windy day here in Virginia, so we're staying indoors. 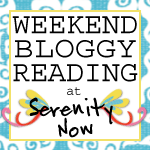 I'd love to see you at this week's Weekend Bloggy Reading link party. It was live on Friday, so feel free to hop on over to showcase your creativity.